It's late spring, and many of us are planning to pause from our routines: whether with a full-on vacation, a weekend warrior adventure, or just by taking a few hours to read a book or tend a garden. Whatever your method, it's a sensible time to ponder the importance of this much-needed habit in our lives. I come to this pondering carrying my predominant perspective as an artist and designer, and how our visual sensibilities long for a break too. We are all aware of how media pervades, and sometimes invades, our lines of vision. From a larger perspective, it takes time to unwind from all the stimulus vying for our attention so that we can actually recover and give our full attention to a particular task. Visual breaks give our line of vision a chance to peer further and deeper than the seemingly endless barrage of advertisements wherever we may turn. In every person’s perspective, there is an innate need to pause in order to refocus our awareness. Amid the seemingly endless options in my local grocery store, I am grateful to see package design begin to exhibit a more minimalistic and graceful approach. It’s an approach I find myself gravitating to visually not only as a customer but also as a designer. Breaking away from visual chaos and clutter of this great country’s endless options on the shelves (especially in the cereal aisle!) feels like a much-needed break. And white space becomes a resting place for our attention. The cereal aisle at the grocery store can be so overwhelming. I love how Kashi's packaging stands out amidst all the busy-ness. LEFT: Earlier packaging. RIGHT: Latest packaging. Just look at the calmer approach to the packaging of Degree anti-perspirant and deodorant. The newer design has so much more elegance and appeal to it amidst the cleaner lines and bolder blast of color and information from years past. Don’t misunderstand: color definitely has its allure. But looking at store shelves these days, the minimalistic approach has a way of standing out. It's more appealing than ever to see this minimalist visual approach play a bigger role in marketing. Sometimes the less content there is, the more eye-catching the design. Apple, “where every detail is the subject of intense obsession,” took years of product branding to prove that minimalistic elegance in product design has a loyal audience. Steve Jobs and Apple’s designer Jonathan Ive took quality products’ performance to a whole new level by paying equal attention to the product design. In order to succeed, marketers must meet the challenge to relay our message clearly, while realizing that these days there is a definite need for more conciseness in the message in the eyes of the beholder. Consumers want information fast, clear, and fresh. “White space” has become more alluring.... Yet it still feels so daring, doesn’t it? Giving marketing content breathing room is actually an elusive art and a challenge to good designers. The mindful deployment of white space can play an important role in succeeding in the marketplace. If the main message maintains its focus, the finer points of a product's brand development can be reinforced in other places—from social media to springing up in the physical world in bold and surprising places. I really like the City of Denver’s official water conservation campaign for the way it combines minimalism with playful ambient messaging. 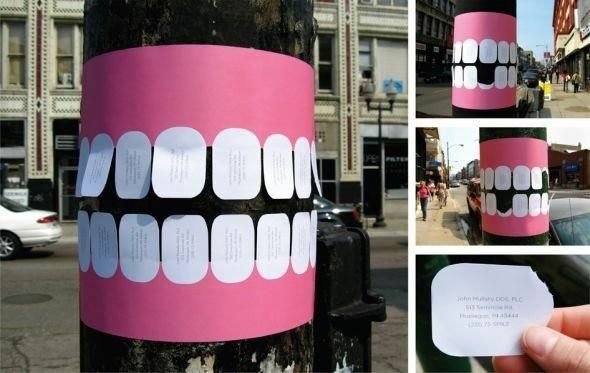 And how about this ambient advertising for a dentist? An entire message doesn't need to occur all in one place these days: it can be conveyed through many different venues. These options allow designers to fine-tune and finesse the imperative content down to its most concise expression. This is an art worthy of the best marketing, and can gain some new customers' eyes by giving them a rest! Contact Studio Haus if you are looking to get your message out into the world in a clearer and more noticeable way. It's what I love to do!